Hello Drop Target readers! 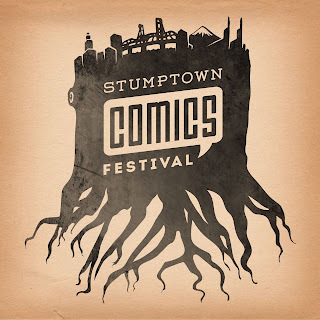 This is a reminder that I will be tabling this weekend (April 27th and 28th) at the Stumptown Comics Festival in Portland, Oregon. I will be at table A-03 and I will have all five issues of Drop Target Zine available. If you are in the Portland area this weekend, please swing by! There will be a lot of other cool stuff there as well. It's always nice to have an excuse to visit Portland because there are like a trillion pinball machines. I will play as many of them as I can... And I'll report back here with some photos and stories from the trip! P.S. I will be out of town and therefore unable to fill Drop Target orders while I am on the road. I'll be back in Oakland on Monday though, so all weekend orders will go out early next week. Thanks in advance for your patience! As promised, here's an image of the shirt I did from Pinburgh 2013! 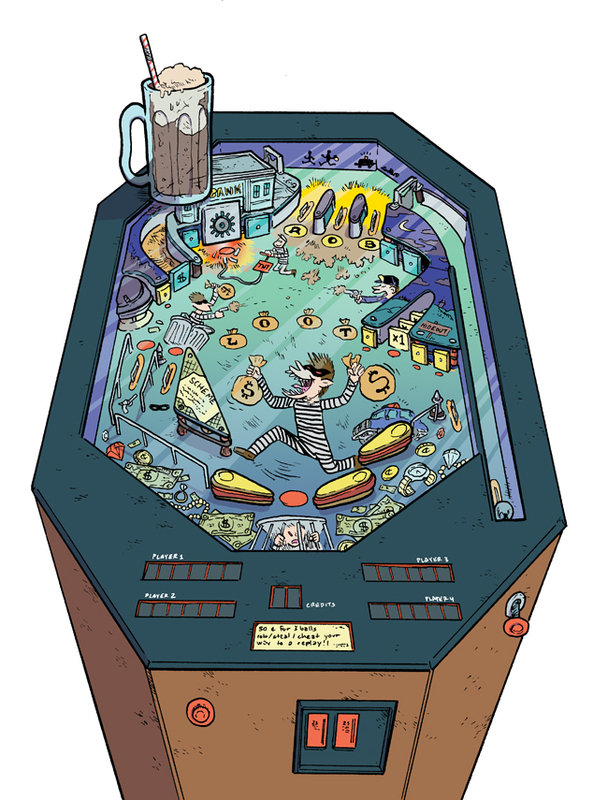 Mark Steinman, the cool cat that I've been working with on these projects, was really taken with the gnomes-running-a-pinball-machine-motif, so we tried to make that a unifying theme with the various projects. The little guys are pretty cute, and really grew on me. The one on the poster with the eyepatch is too cute for words! Even though I used to work as a screen-printer, making shirts, and I TEACH screen-printing at the Center for Cartoon Studies, I always have a hard time narrowing down my color palettes! This is four colors printed on a red shirt, and even narrowing it down to four was haaaaaaaaarrrrrrrd. 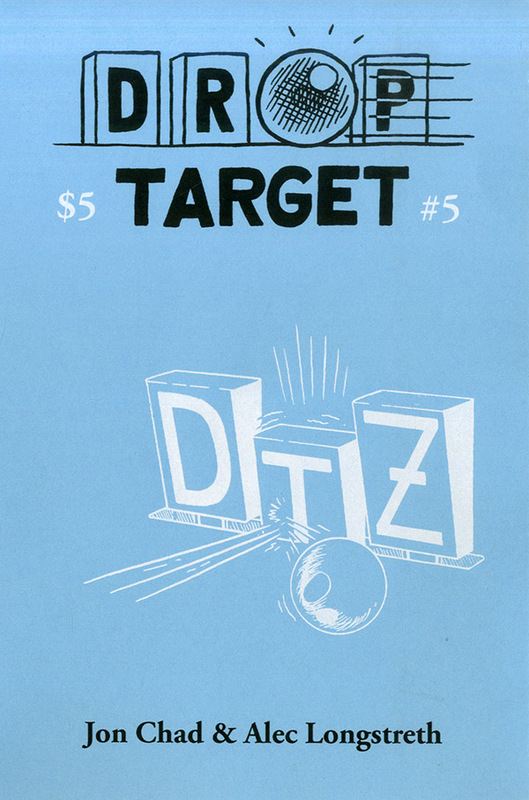 Drop Target Issue 5 is available for ordering! - 6TH ANNUAL PACIFIC PINBALL EXPOSITION: A written account (with illustrations) of Alec's first trip to a pinball expo. 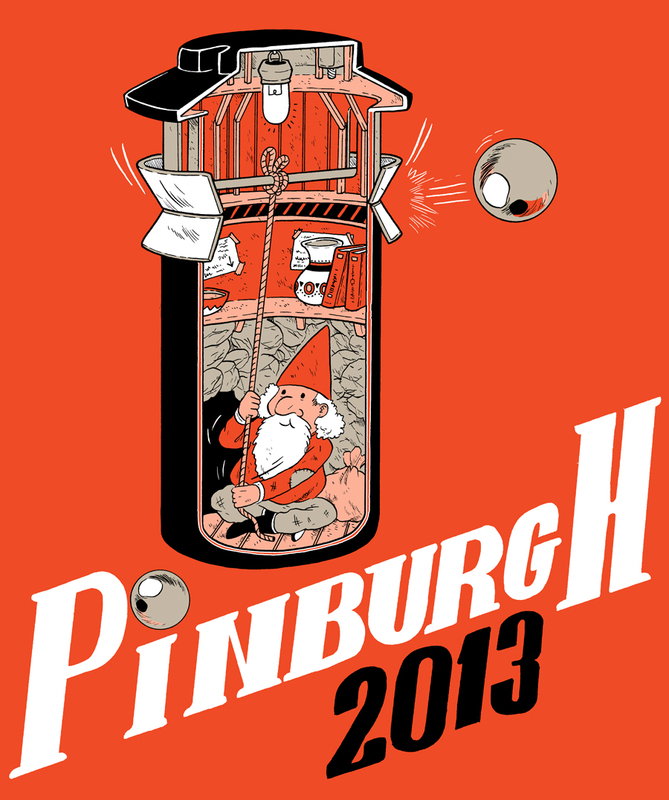 - OBSERVATIONS ON A COMPETITION: A comic about Jon's first trip to a pinball competition: Pinferno 2012! - MY DAY WITH THE CRAZY FLIPPER FINGERS: a comic by Alec Longstreth! If you would rather pick up a copy of Drop Target #5 in person, you will have two opportunities to do so this month: 1) Our amazing center spread artist Ryan Claytor will be at the Small Press and Comics Expo this weekend (April 13th and 14th) in Columbus, Ohio. 2) I will be at the Stumptown Comics Festival on April 27th and 28th in Portland, Oregon. 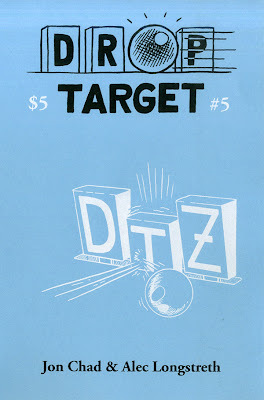 I will have all five issues of Drop Target available, so swing on by! 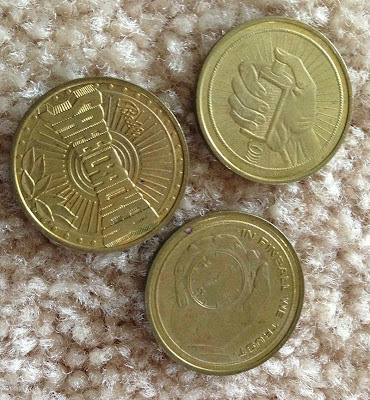 Also, a heads up for those of you who are collector-types... There are only about 25 copies left of the first printing of Drop Target #2 (with the full-color center spread and a screenprinted cover on colored paper). After those are gone, they're gone! We will then make a second printing, similar to the second printing of DTZ #1 with a grayscale center spread and a black and white cover, with a $4 cover price. You have been forewarned! Okay, well, we know this issue took a long time to make, but we really think it is going to be worth the wait. At 64 pages, it is our longest issue yet! This was a Dream Machine that I posted on the Stern Blog a couple months ago. I have been on an obsessive kick with cocktail pinball tables. I see this as an obvious solution to not enough private pinball owners. 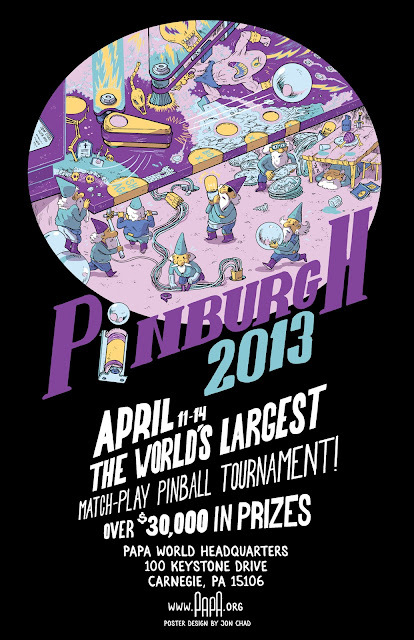 There are a lot of pinball enthusiasts who, like me, rent an apartment. Space is a premium. Not only does a cocktail pinball table take up less space, but it doubles as a piece of (level) furniture that every apartment needs. So, when I thought about drawing up a cocktail pinball table, the first thing I thought of, was, "what would be the most AWKWARD-themed pinball machine to have to show a date when they came over for the first time?" My answer was, "crime/mugging/robbery". It turned out to be a pretty rad table, but it is a little too creepy! Whoa whoa whoa! Let's get our stories straight! That is a mug of ROOT BEER on the machine! ROOT BEER! What is it about throwing people into pinball machines? Is it just that this sort of thing is usually going down at a bar, and of the many things in a bar to be smashed, a pinball machine is the best prop? I like to think it causes the most visceral reaction from the reader/viewer not only because you can imagine the pain of being thrown into all that glass and wood and metal, but also because it's an instant bummer to know that there would be one less pinball machine in the world, and that bar would instantly be that much lamer. Or who knows, maybe it's just so storytellers can use the "TILT" gag. Since the time I did this poster, there are (over?) 400 players registered, and OVER $60,000 in prizes!?! I went to Pinferno 7 in NYC last January, and was COMPLETELY overwhelmed. I can't even imagine what a 400 player match-play tournament is like!